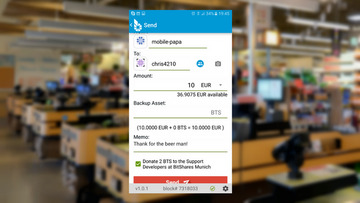 The Smartcoins Wallet (shown) allows you to pay at any BlockPay supporting merchant worldwide. BlockPay is a free app that allows any merchant to accept one or more cryptocurrencies at zero cost. The app runs standalone, or with multiple integrated systems (such as Odoo, SAP, Shopify, and so on). All the merchant needs, is to install the app into their existing Point Of Sale system. The app is in 44 languages, supports Loyalty Points, QR codes and NFC, automated accounting, and is another path to profits.